If you ask me, the best way to increase your speed is to run fartleks, informal accelerations done during a normal training run. If you want to run faster races, mix a few sprints into your runs. Within a week, you'll notice big gains in speed and general fitness. I was first introduced to the technique when my Florida Track Club running-neighbor in the Green Latrine in Gainesville, Florida told me about his running idol, legendary coach Percy Cerutty, and his fartlek method. I soon bought "Training with Cerutty" by Larry Myers and began reading about Cerutty's theories and his training methods. Cerutty had a lot of eccentric ideas for his runners: sleeping under the stars, mimicking a racehorse's running style, emphasis on upper-body training. But when I later began running races regularly, I tried out fartleks, and found that they worked for me. One of the best things about them is that they're so easy to integrate into your training schedule. You don't have to add any new disciplines or workouts to your routine. Just add accelerations as your momentary fitness allows. Head out on a typical training run. Give yourself a few minutes to get warmed up. When you feel ready, look for a spot at least 100 meters ahead on your path. Now just speed up to a fast pace and hold it until you pass the spot. Your heart-rate should be noticeably faster now. Then slow down again to your normal pace (or slower, if needed) and run for at least a few more minutes until you recover. Repeat for a total of 3 or 4 times during a half-hour run, or 5-6 times for an hour run. That's it. You can do it without setting rigid start/stop intervals. Just do it as you feel ready. If you are feeling especially weak, lower the acceleration speeds as needed. In the end, this will add much more to your fitness level than adding much longer, slow runs to your plan, like 20-milers. Of course, you'll need to run some long runs too. But if you're training for a marathon, half-marathons are as far as you'll need to run during your training runs. With fartleks mixed in, your training speeds will soon be much higher, and you will see less and less difference between your normal pace and your acceleration pace: the fartleks will almost blend into each other. I re-learned the lesson about fartleks myself in the last months, hence this article. Over the years I have been slowing down from my earlier form. 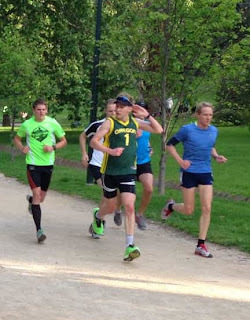 After 35 years of running, with various knee injuries and an operation, and now general arthritis, I had cut back my running more and more: fewer runs, shorter and slower until I was down to a couple of 20-minute slow runs a week. But I noticed that when I was traveling somewhere interesting and I wanted to run just a simple 10-km route, I felt shattered afterwards. I had cut down my running too far. So, I decided to increase my fitness again, by running longer, more often and with fartleks. Within weeks, I felt like a new person. And so far, my knees have held out. And as long as they do, I'm sticking with my fartleks. What a difference they have made! Just what I needed to see, John -- about having cut back too much; I, too, am now down to a few 20-min runs a week, but I'll try some fartlek to get back in the game. Thanks!